The Saturday Six is a weekly look at the most interesting, most fun, and sometimes even the most outrageous things within the theme park world that we all love so much. Whether it’s checking out the World’s Largest Hard Rock Cafe in CityWalk, a look at Marvel Superhero Island in Islands of Adventure, or even going to Mickey’s Not So Scary Halloween Party, the Saturday Six is your personal guide to experiencing the very best Orlando has to offer. 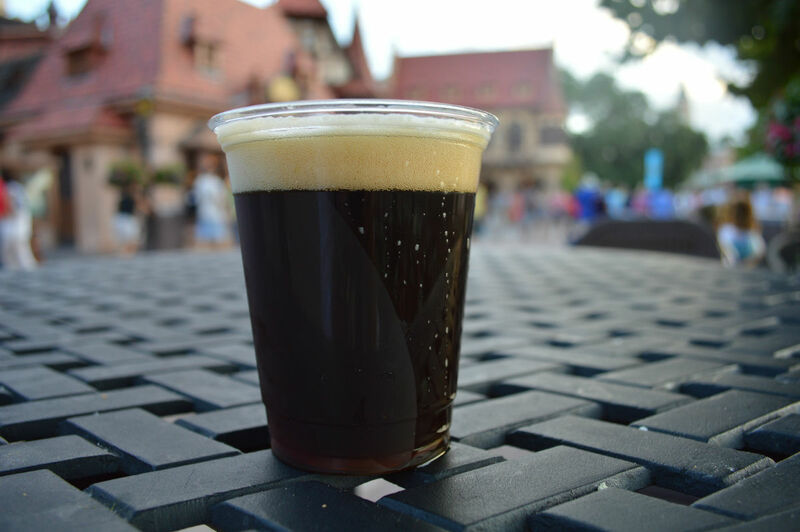 This week’s Saturday Six looks at the Top Six Reasons We Loved the 2013 Epcot International Food & Wine Festival. An annual event that originally started in 1995, Food & wine has grown each year and has become one of Orlando’s signature events of the fall. Over 25 marketplaces are placed around World Showcase and each bring their own unique food and drink offerings that offer guests the amazing opportunity to challenge their culinary palate and experience dining opportunities that just don’t exist in the theme park world during the rest of the year. But that’s not all, Food & Wine has a whole bunch of other stuff going on at the same time including seminars, concerts, and even the chance to meet celebrities from the world of food and wine. We loved this year’s festival but what are our favorite parts? For that we need to start the list~! I don’t know what it is about it, but I am completely mesmerized by the cranberry bog. At night, it actually looks like it could fit in well over at Universal’s Halloween Horror Nights. 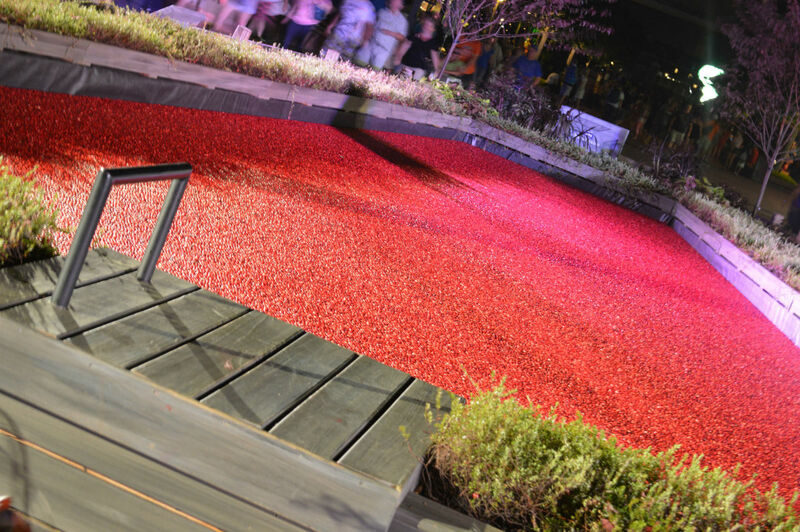 During the day Ocean Spray has representatives who will guide guests through the process or harvesting cranberries. Here you’ll find out that cranberries grow on lung running vines and Ocean Spray (along with other cranberry farmers) use rake-like tools to brush them into water. Because the cranberries have air pockets in them, they float, so the berries are then collected en masse. I love watching people wade through the cranberry bog and continue to try to wrap my mind around the fact that something like this exists in the real world. It also will allow me to drop some knowledge bombs during my next Thanksgiving dinner when I explain where the cranberry sauce comes from and – as a bonus – there are free packs of Craisins nearby the bog at the Ocean Spray booth. Throughout the Food and Wine festival there are bands playing live for the Eat to the Beat concert series. While some of the names may not be recognizable at first, you’ve more than likely heard the bigger hits from almost every group playing. Whether it’s Hanson’s “Mmmbop,” Wilson Phillips’ “Hold On,” or – one of my secret shame favorites – the GoGo’s “Our Lips Are Sealed,” you’ll be finding yourself singing along to many pop hits. Each band plays three shows per night (5:30 PM, 6:45 PM and 8:00 PM) at the America Gardens Theatre. 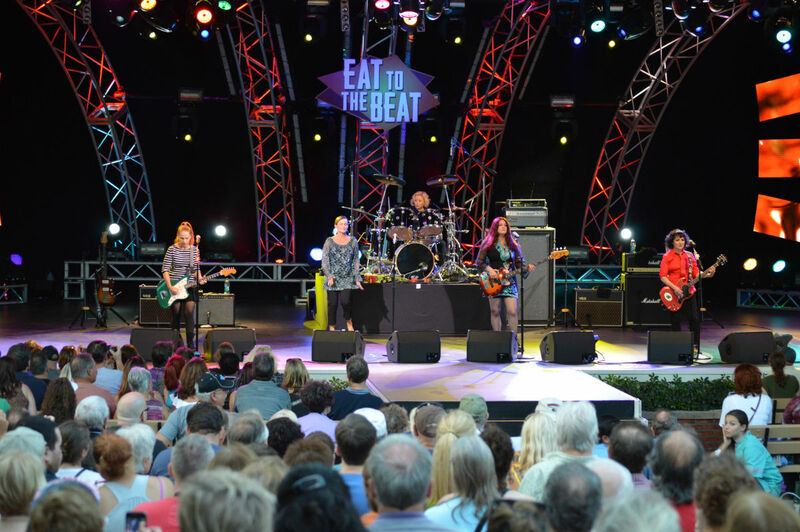 The Eat to the Beat concert series this year includes: 9/27 – 9/29 – Starship (featuring Mickey Thomas), 9/30 – 10/01 – Go-Go’s, 10/02 – 10/04 – Air Supply, 10/05 – 10/06 – Sister Hazel, 10/07 – 10/09 – Sugar Ray, 10/10 – 10/11 – Edwin McCain, 10/12 – 10/13 – Manhattan Transfer, 10/14 – 10/15 – Wilson Phillips, 10/16 – 10/17 – The Pointer Sisters, 10/18 – 10/20 – Night Ranger, 10/21 – 10/23 – Boyz II Men, 10/24 – 10/25 – Survivor, 10/26 – 10/27 – 38 Special, 10/28 – 10/30 – Smash Mouth, 10/31 – 11/01 – Spin Doctors, 11/02 – 11/03 – Christopher Cross, 11/04 – 11/05 – Hanson, 11/06 – 11/08 – Dennis DeYoung (of STYX fame) and 11/09 – 11/11 – Big Bad Voodoo Daddy. # 4 – The Merch! The staff of the Saturday Six also write The Magic, The Memories, and Merch! 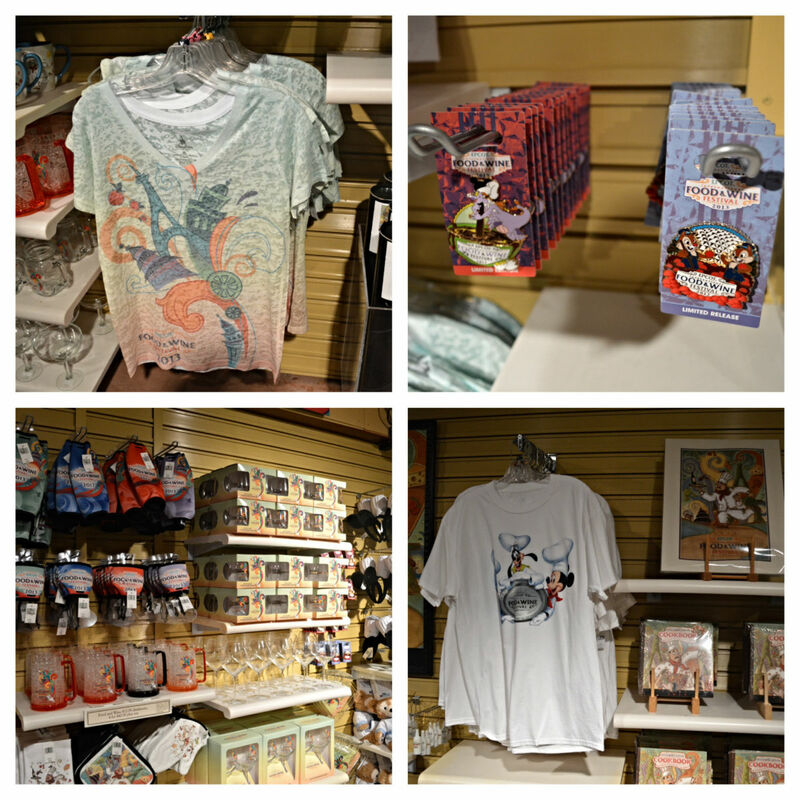 columns for the TouringPlans blog, so we’re always looking forward to exclusive merchandise from Disney and Universal. 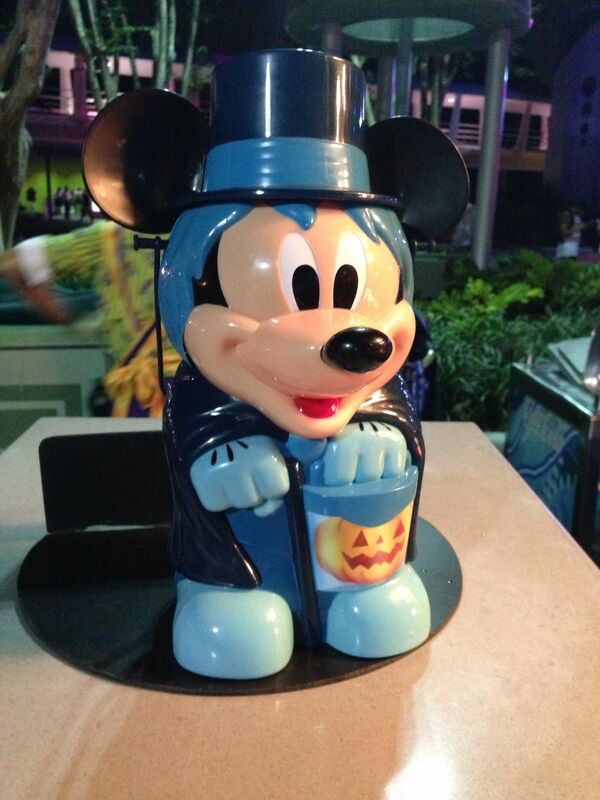 We were pretty disappointed with the offerings at Disney’s Night of Joy and to be honest, the selections available at this year’s Mickey’s Not So Scary Halloween Party were nothing to write home about either (including the creepy looking Mickey-as-Hatbox-Ghost popcorn bucket.) 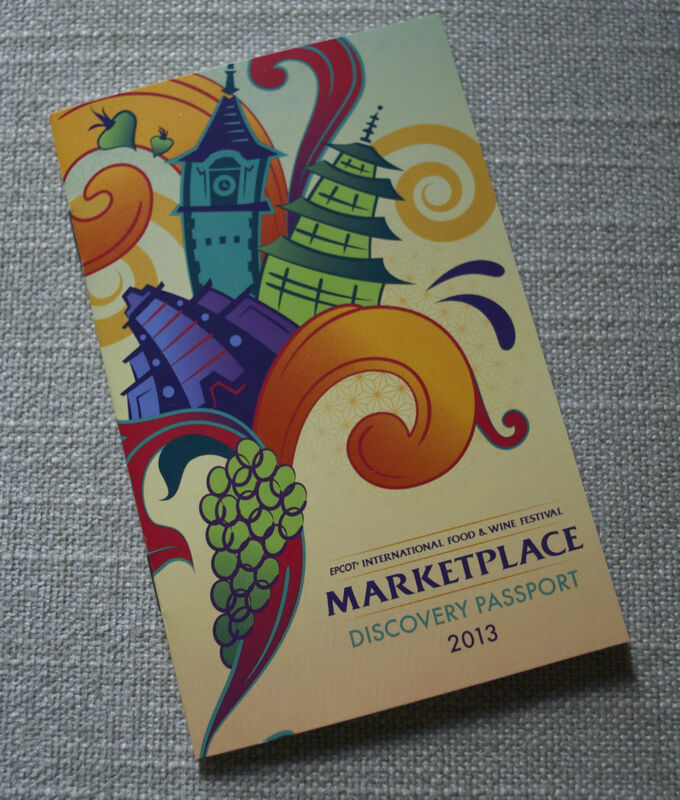 So you can imagine our surprise when discovering the Food & Wine festival is loaded with good merchandise. This is actually made of chocolate. Hosted by the Ghiradelli chocolate company, this exhibit made its debut during last year’s festival and makes a triumphant return this year. Just an awesome experience. One of the highlights is seeing several almost unbelievable sculptures created by Disney chefs that are made completely out of chocolate. These dioramas were straight out of a high end dessert show on the Food Network. 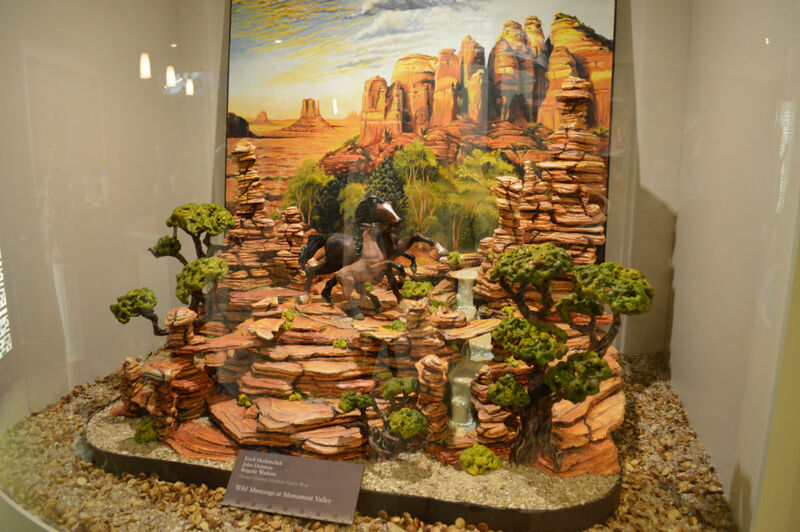 My favorites included a western scene from Grand Floridan chefs, a bungalo-on-the-beach piece by chefs of the Boardwalk resort, and a Lion King themed one from Hollywood Studios chefs. Was completely blown away by the overall artistry. Any menu promising a “liquid candy bar” gets a thumbs up from me. 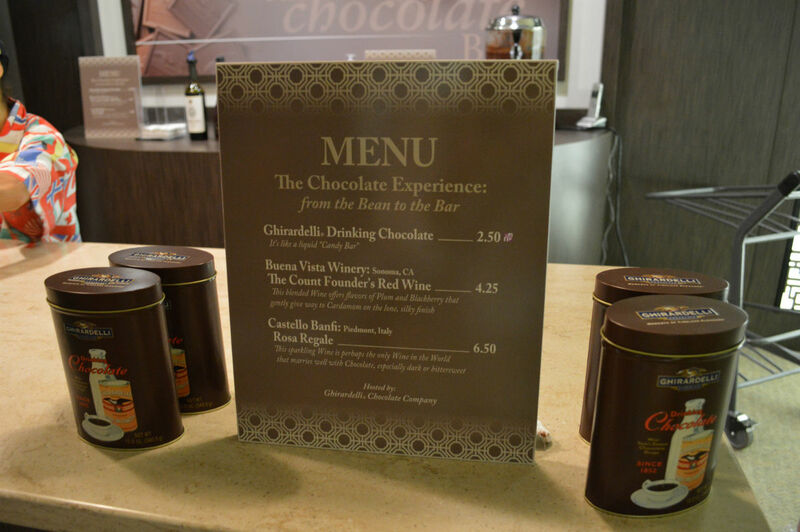 The Chocolate Experience itself is included with your Epcot admission and is located in the Welcome Center. While in the Welcome Center you’ll also have the opportunity to check out the other offerings including The Art of Food & Wine area (where you can look at – and purchase – prints and original art), book and wine signings from celebrity chefs and winemakers, and check out if any of the various demonstrations or seminars catch your interest. Keep in mind that most of these seminars have a separate charge including a Mixology one for $15 that piqued my interest after watching the show Bar Rescue on Spike. I’m using “wine” in quotation marks because I’m more of a beer man myself, but regardless if you happen to be a person who partakes in alcohol you are going to be quite happy with this year’s festival. Not only does every booth offer their own alcohol selections, but there are a couple booths dedicated completely to alcohol including Brewer’s Collection and Craft Beers. I’m a huge fan of beer flights (I like to think of them as “alcohol sliders”) and greatly enjoyed the beer flight at Craft Beers that included Dogfish Head Brewery Namaste, Abita Brewing Company Fall Fest, Leinenkugel’s Seasonal Shandy, and Florida Beer Company Devil’s Triangle. After their work on brewing Hog’s Head Ale for the Wizarding World of Harry Potter and Duff Beer for Springfield USA over at Universal, I will always support anything made by Florida Brewing Company. 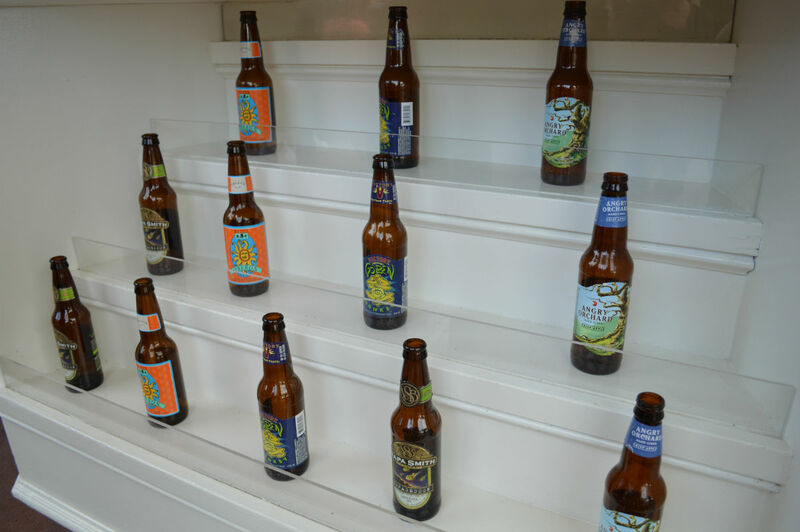 Craft beer selections from Block and Hans at the American Adventure pavilion. USA! USA! USA! At the Brewer’s Collection we tried BraufactuM Darkon. This was a dark, malty beer with hints of chocolate or coffee. Great taste, and but it’s generally geared towards people who prefer darker and stronger beers and actually reminded of the Duff Dry I had in Moe’s Tavern. At the Desserts & Champagne booth we tried a glass of Chandon Nectar Imperial. I would describe this glass of champagne as having a touch of sweetness with an overall fruity taste and crisp finish. We finished up in Scotland and tried a cup of Innis & Gunn Original. This was a reddish brown color beer, medium strength with hints of oak and what we assumed to be scotch or whiskey. All things considered, we’re going to give our Best In Show award to Innis & Gunn Original as the oaky flavor and the whisky/scotch finish was something we’ve never experienced in a beer before. # 1 – THE FOOD! This is what we all came for, right? The marvelous food selections that arrive every year courtesy of Food & Wine. It’s a foodie’s dream and a Weight Watchers nightmare, but we love eating Around the World. Many of our favorites are back, including the Kalua pork sliders in Hawaii, Ireland’s Kerrygold cheese sampler, and our one Must Do every year, Germany’s roast bratwurst in a pretzel roll. However, this year we were on a mission. We set out to see how many food selections were available to vegetarians and found out there were actually quite a bit this year. 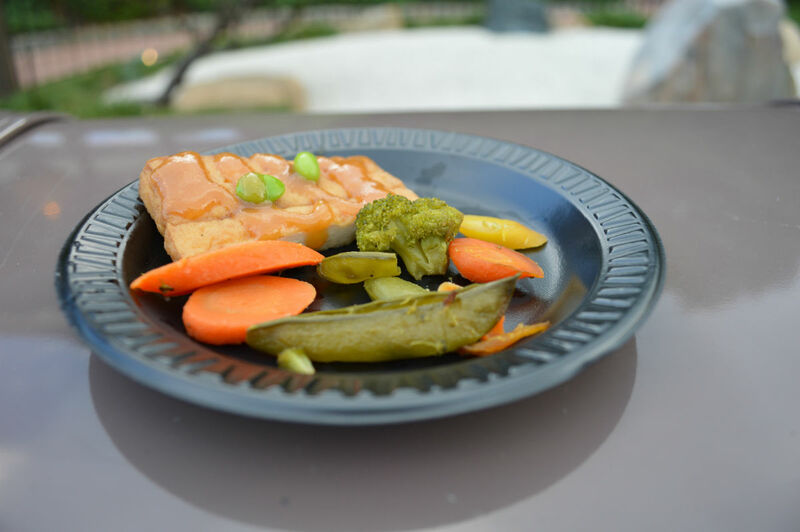 We even wrote a blog about it: Eating Vegetarian at the 2013 Food and Wine Festival. We couldn’t leave without trying a couple meat dishes, and can give big thumbs up to the Florida Local booth’s grass-fed beef slider, Belgium’s potato and leek waffle with braised beef, and the spicy Kimchi dog from South Korea. So many great choices throughout the Marketplace this year that it has us already looking forward to our next trip. This article barely scratches the surface of everything you’ll experience at this year’s Food & Wine. Be sure to pick up a Discovery Passport before you begin your journey, as it lists all the countries, has all the menus (along with a convenient checklist to mark off all the items you have tried), and has a spot where you can receive a stamp from each country you visit! Stop by the Festival Information Center after you enter the park to pick one up. The Epcot International Food & Wine takes place daily from September 27 through November 11, 2013. Special thanks to Brandon Glover and Morgan Crutchfield for their assistance with this week’s Saturday Six. Yippee! We get to see Big Bad Voodoo Daddy. I’m already dancing! I had the pleasure of being at Disney during the Food and Wine Festival last year, and it was AMAZING! I was wandering if the Chase Lounge in the Festival Center was back this year. My family enjoyed it last year. It’s back, and it also has one of the only Coke Freestyle machines on Disney property available to guests. However, it has been moved from the Festival Center over to the America Pavilion. All you need is your Chase credit card (it doesn’t have to be the Disney Chase Visa) and you’ll be given access. There are TVs, magazines, places to recharge your phones and – most importantly to me – air conditioning to get out of the heat. No shame in liking the Go-Gos. The same can’t be said about Hanson or Wilson Phillips. Did you get a chance to try the einstok white ale in the festival center? If not you should do yourself a favor and get some! It’s my favorite of the festival!